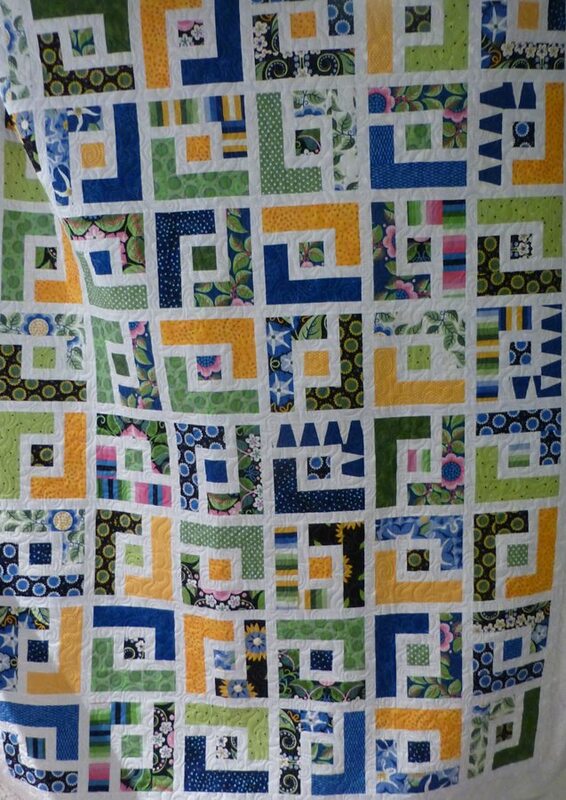 This beautiful antique quilt top was an auction find that my mother-in-law purchased. 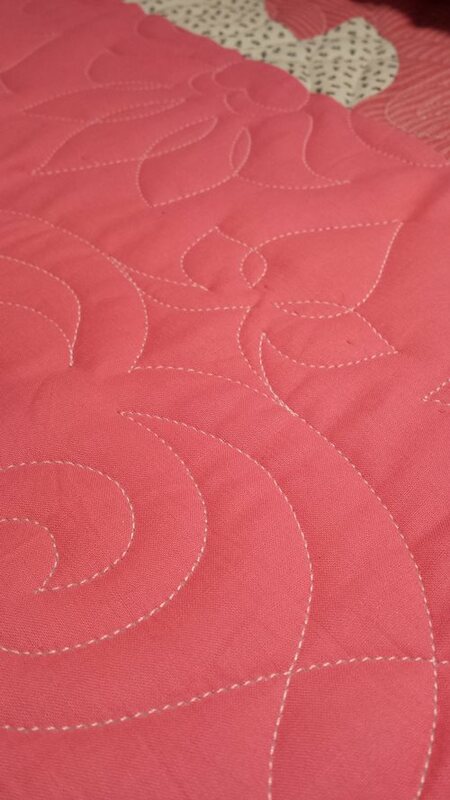 (shh… under $10) I added good quality muslin (Fat Quarter Shop has 108″ that is really nice) for the backing and binding. She likes my Pantagraphs and has me choose them as we go. 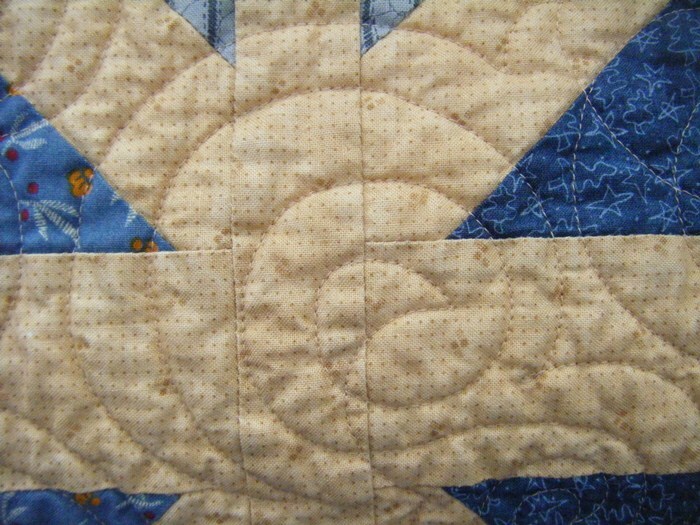 The center Drunkards Path blocks were pieced by hand and were all well done. No repairs were needed. I think they are feed sack fabrics. It isn’t exactly all the same prints but they look near enough alike that the eye thinks they are the same. Maybe this top has a story about digging through sacks to find more that coordinate! 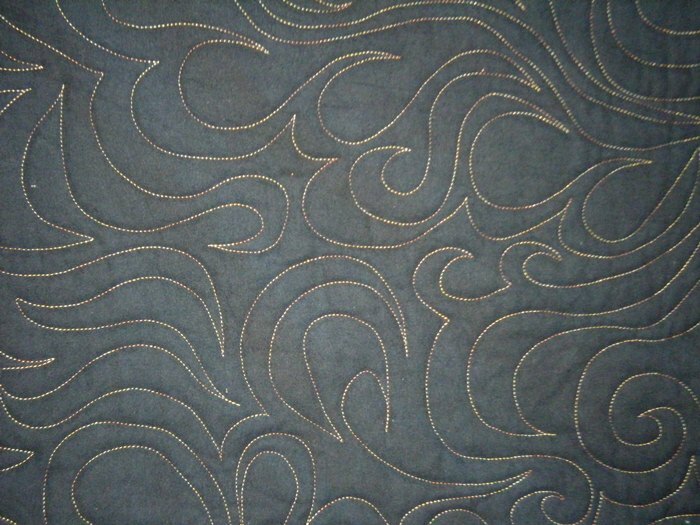 The border fabric was added later by machine and seems to be from a different decade. Part of the finishing includes a label. Because it is for family, I give it a wash in my machine to clean up years of dirt & etc as well as (especially for this one!!) remove various and excess dye. It has a lovely, cuddly grandmotherly feel and look to it now. Now usable instead of sitting on a shelf in the closet. 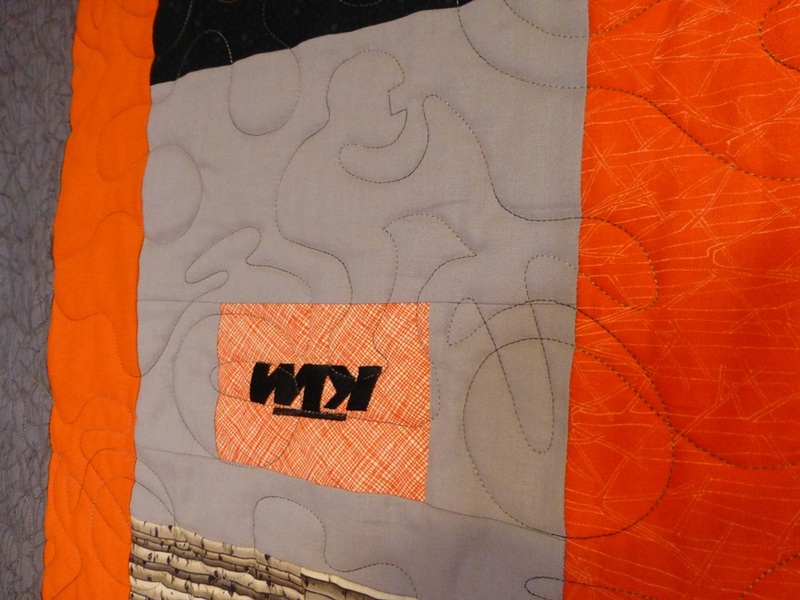 Best use for a quilt! 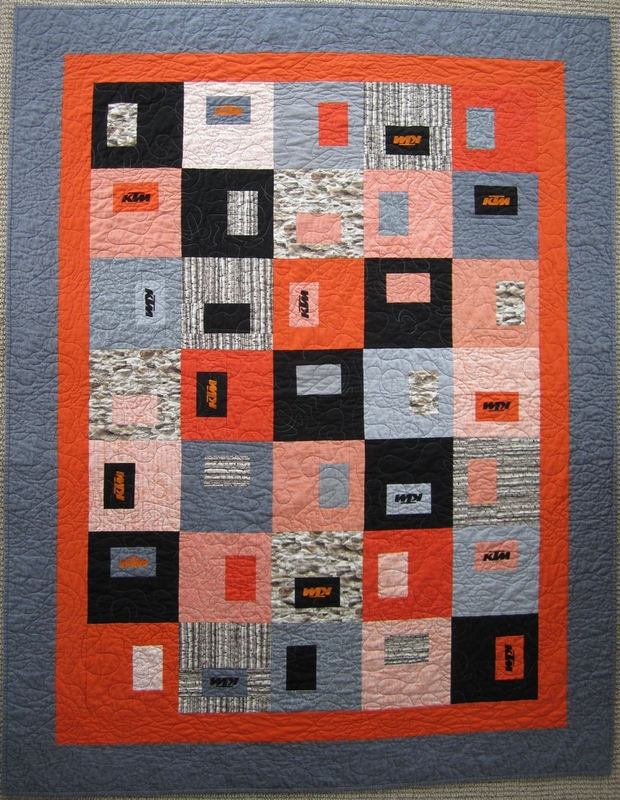 A new addition to her home prompted this quilter to make a new quilt to coordinate with her new room. 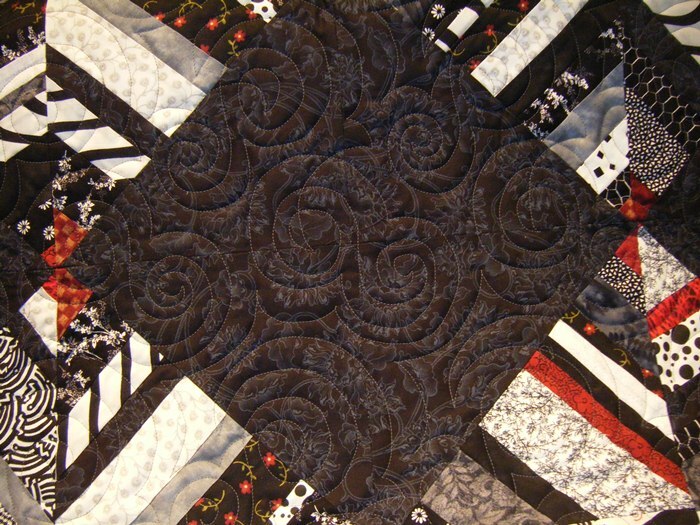 She used the pattern, Marcie’s Maze, and used purchased pieces, not a jelly roll as the pattern suggests. 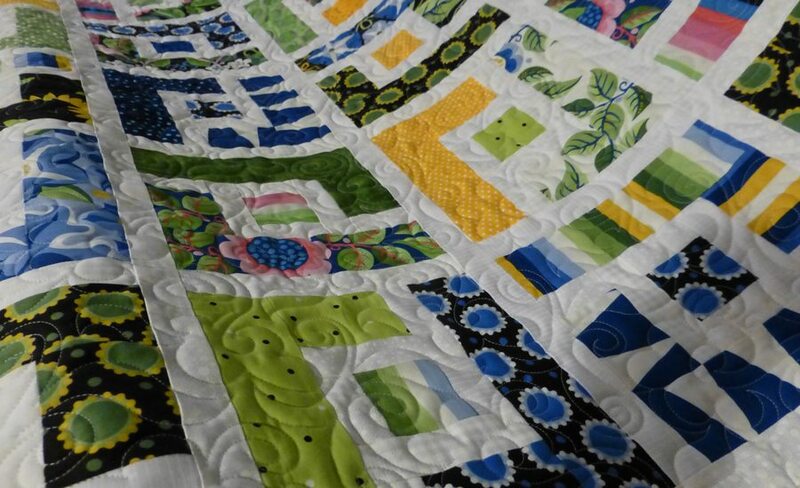 Super cute fabrics and great piecing! Doesn’t this make you wish you had a new sunroom to decorate? 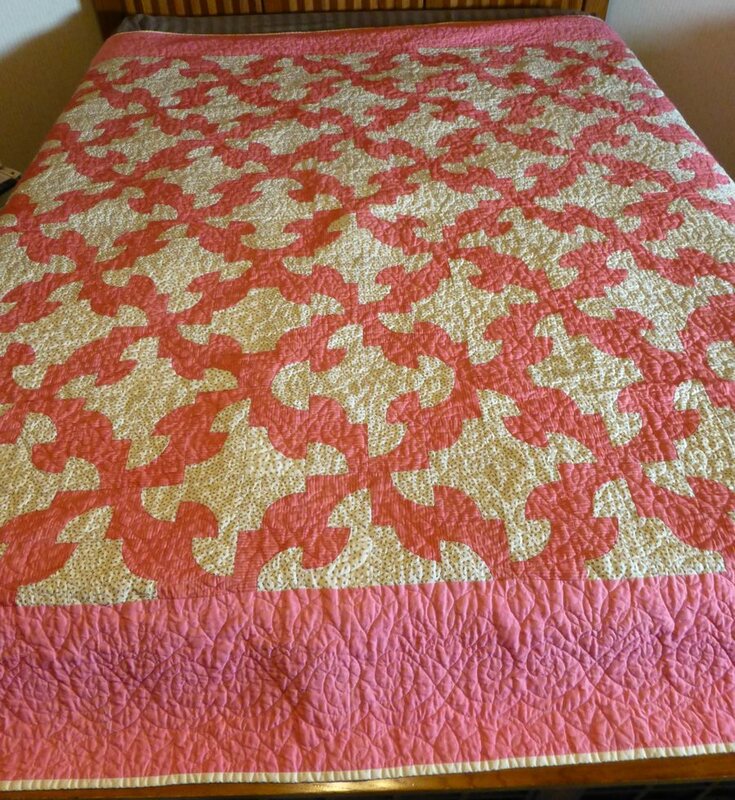 I started this quilt at a quilt retreat in July and worked throughout the fall on the piecing. 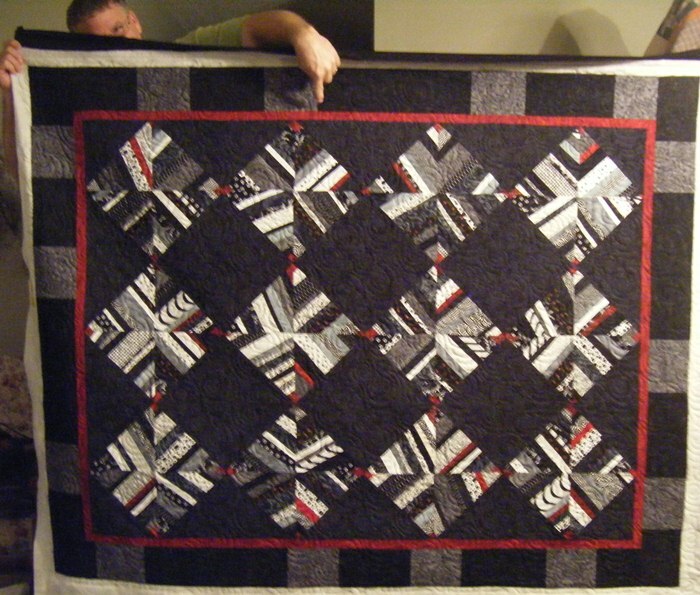 I finished it over Christmas & New Year’s. 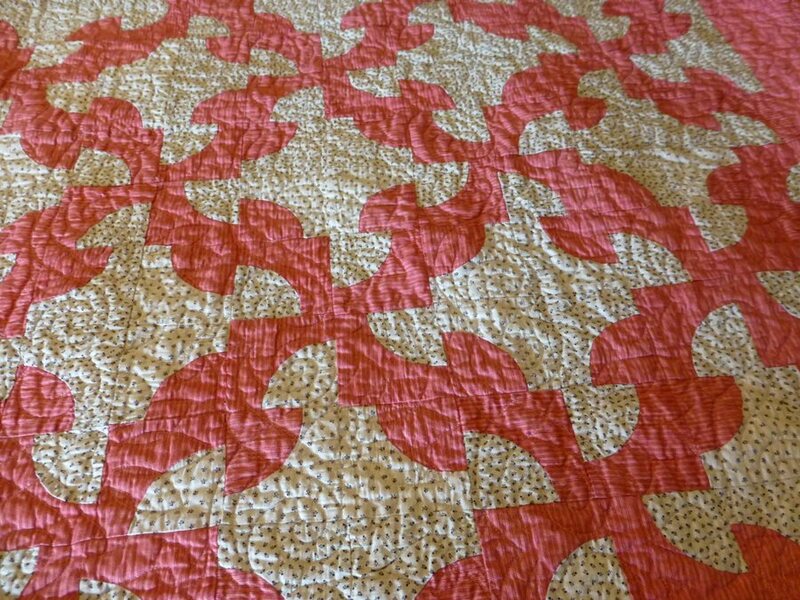 The pattern is called Shoo Fly, Oh My. 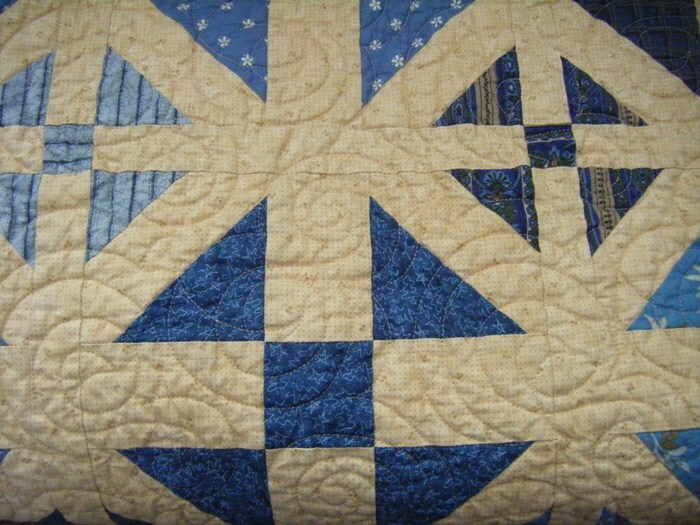 The regular Shoo Fly block and then little ones in the sashing that make you say, “Oh my!” when you are piecing them! 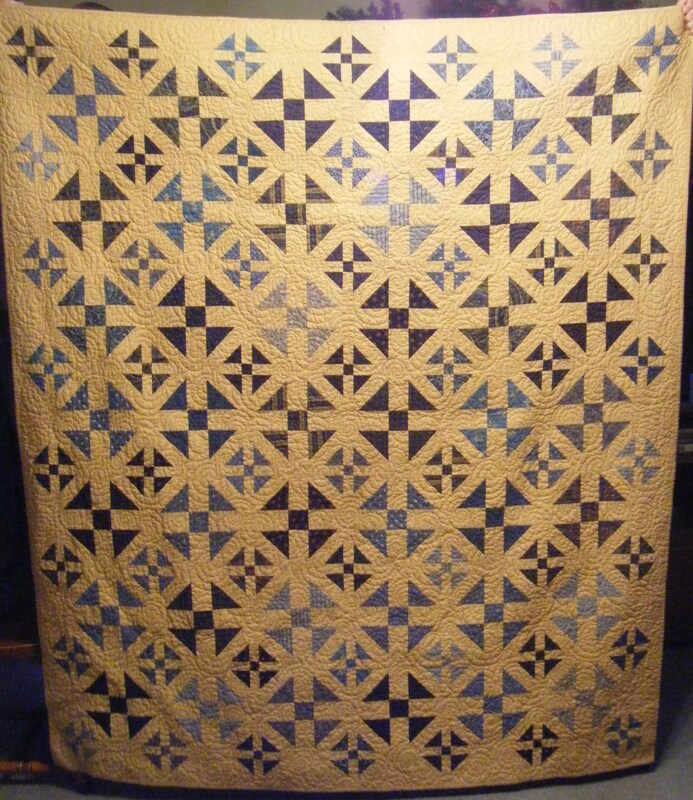 I quilted this in a circular pattern using a pantograph. 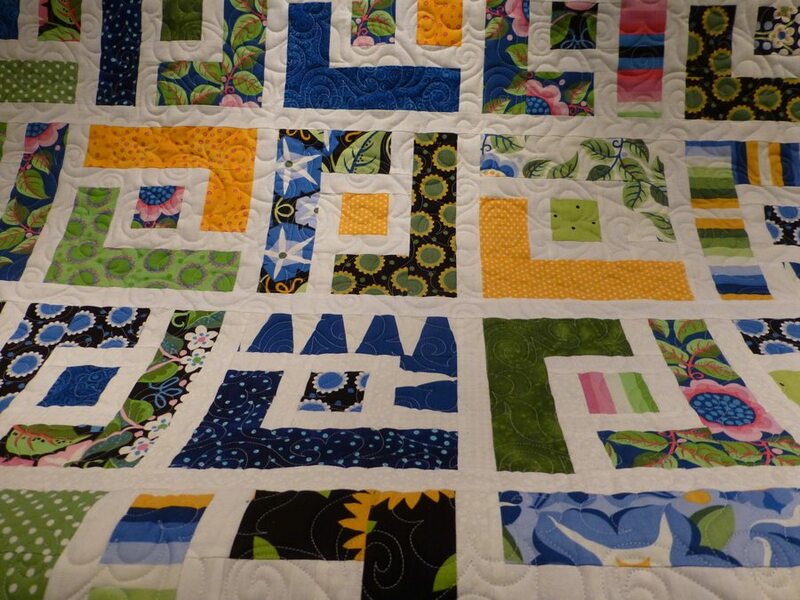 I think the circular quilting compliments the angular piecing. 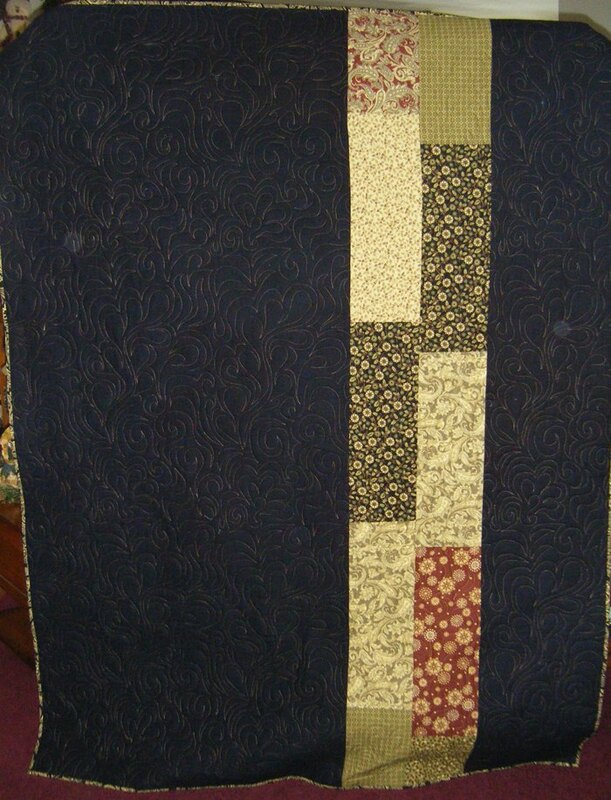 The back with black flannel and some of the leftover fabrics for a dynamic pieced back. 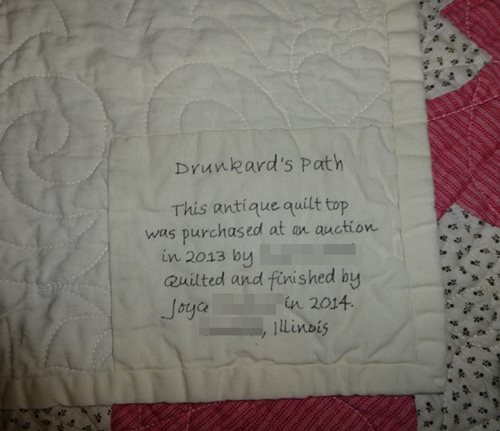 My friend had a request from her hubby for a quilt and she lost the umption for it… oh, a few years ago! 😦 We’ve all BTDT!! 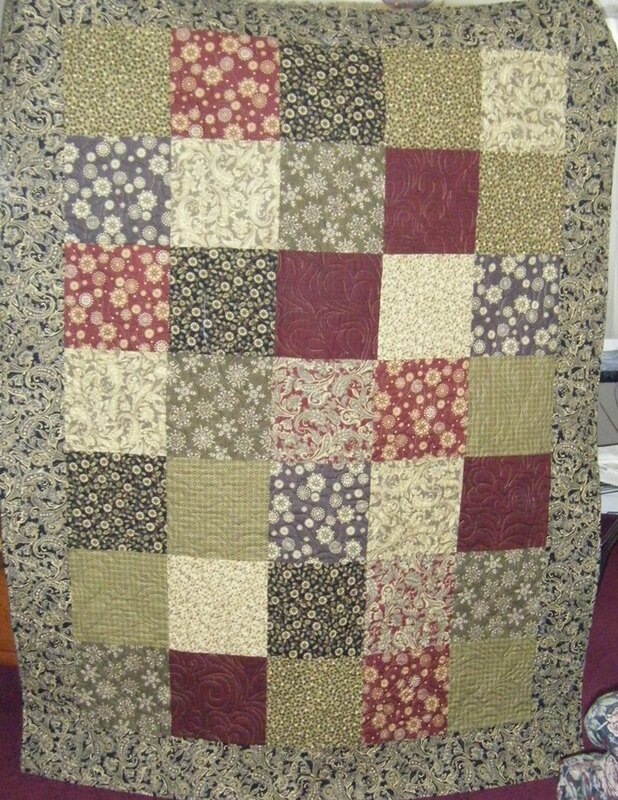 This fall with our sewing group she pulled it out to work on while we were together & visiting. Good idea! Since one of the holders is friends with the recipient, he thought comedy was needed in the photo. 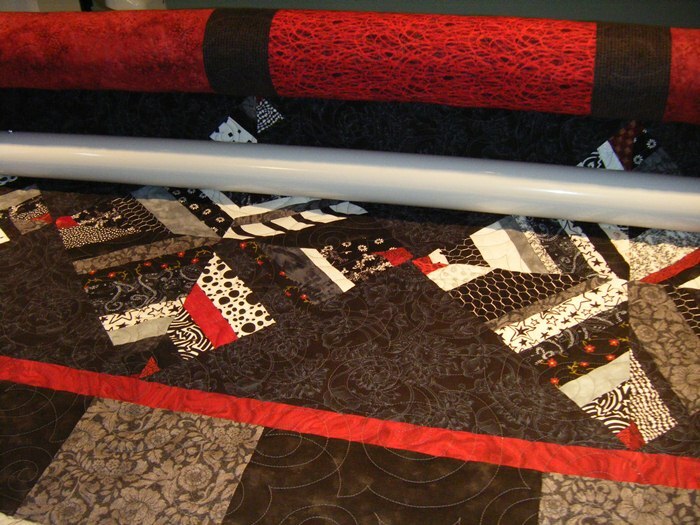 :eyeroll: The narrow red border & scrappy outer border add a great touch to the center strippy blocks.